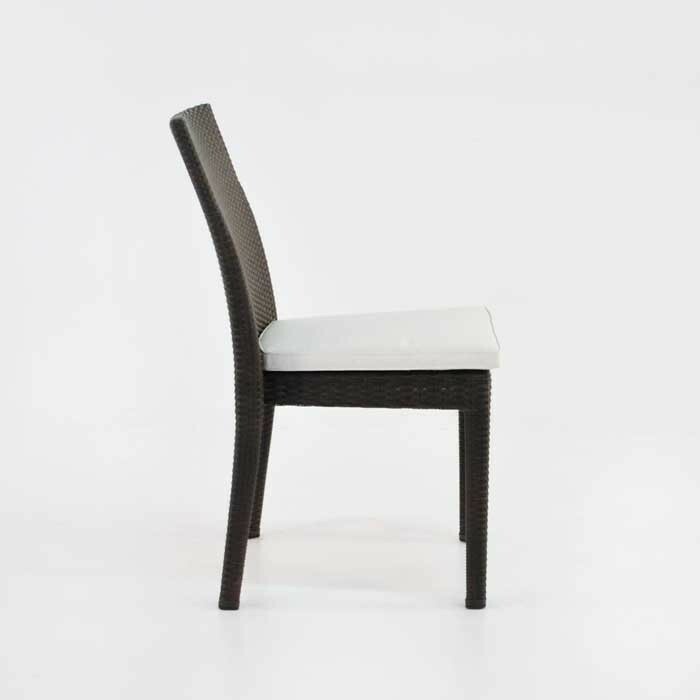 Charming, appealing and convenient, the Romansa Wicker Dining Side Chair in Java is an excellent choice of chair that suits many styles and areas. 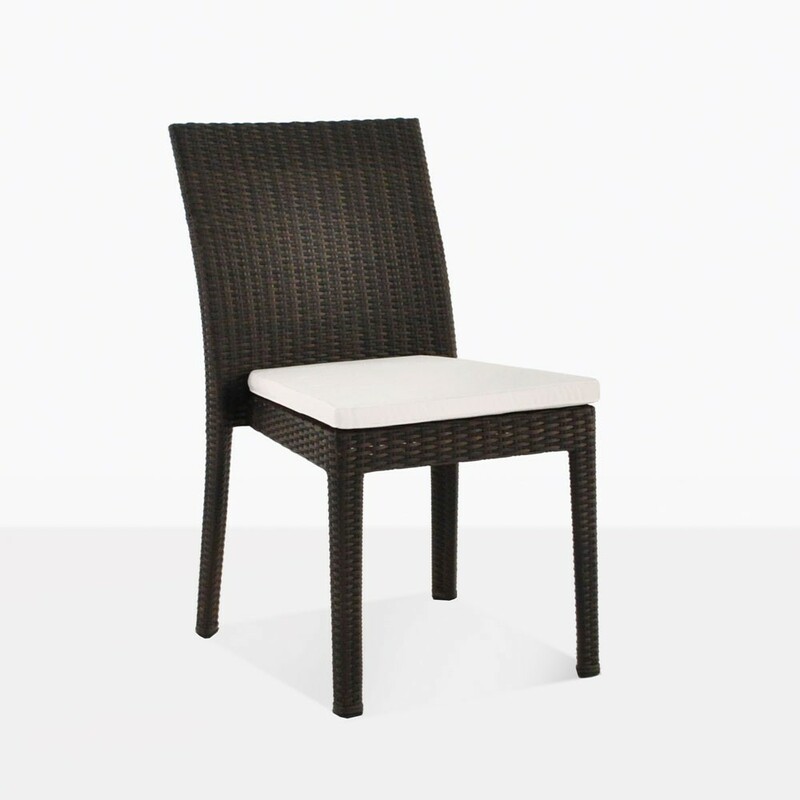 The ultimate wicker stacking chair; the Romansa Wicker Dining Side Chair (Java) is a solid and comfortable chair while being easy to store away, useful for boats and when you may have extra chairs to support an extension table. 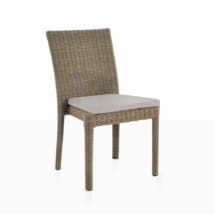 Simple in style; the Romansa Wicker Dining Side Chair (Java) features a solid weave of wicker through the back and seat, while the legs are slender and easy to stack. Our Romansa range is made from top quality Viro® wicker in a choice of two colors: java or Kubu, and is supported by a powder coated aluminium frame and dressed with a Sunbrella® cushion for comfort. Viro® is well regarded as a durable, easy to maintain and attractive product. Award winning for its eco-friendly business model and fabulous designs, Viro® is an amazing material we use in dining chairs, relaxing chairs, deep seating and sun loungers. Easy to clean, you can simply hose down a Romansa Wicker Dining Side Chair (Java) chair or wipe it with a sponge if anything spills on it! Teak Warehouse specializes in products that are not only beautiful, luxury items but marine quality and simple to maintain. We like to take the hard work out of buying furniture, simply tell us what you’d like, we will arrange a quote for the items and delivery. Once the purchase has been made, you will have your items set up in your space in a matter of weeks! (Or days for the locals!) Whether you’re drawn to wicker, or pondering teak, we have an excellent range of furniture that will extend your living space to the great outdoors. Add a sense of panache to your teak dining table with the addition of wicker. Purchase on of our new Reclaimed Teak Tables, and line the sides with the Romansa Wicker Dining Side Chair (Java), with a Romansa Arm Chair on either end, for an overall modern look, pairing the chunky, rustic flavor of the wood with a simple and elegant chair. Try 6 Romansa Wicker Dining Side Chairs (Java) around one of our A-Grade Teak 70” Rectangular Table for a simple, succinct and attractive look. Place a medium sized Sunbrella® Umbrella in the center of the table to keep you shaded during the hot summer months. 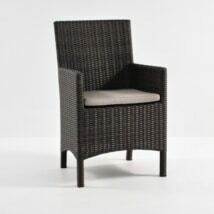 These pleasing stacking wicker chairs are a great indoor chair as well as outdoors. Place several Romansa Wicker Dining Side Chairs (Java) around a glass dining table for an intriguing meld of materials or try one of our robust trestle style tables to complete a farmhouse look! Romansa is also available as an Arm Chair, so you can create the perfect, all-year-round dining set! All these products are completely suitable for use outdoors all year round, while the handsome design makes it appropriate for indoor use also. Call us now! Our sales staff will help you to discover the combination that will work best in your space!